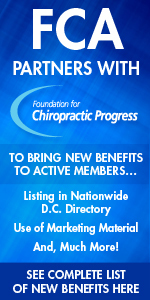 The First Coast Local Coverage Determination (LCD) for Chiropractic Services has been updated, to be effective for dates of service on and after September 12, 2016. Of immediate importance are the primary diagnosis codes which have changed for billing. First Coast Service Options, the Florida Medicare Contractor, has published an implementation date of September 12, 2016 for the new Chiropractic LCD. The HHS Office of Civil Rights (OCR) has launched its Phase II HIPAA Audit Program. Physician practices will be selected for audits. Significant fines will be levied on practices that do not have a compliance program in place. Read more to download the new 2016 HIPAA Compliance Manual and compliance forms today and fully implement them to avoid fines in the event of an audit. The manual is free to FCA members. The most inexpensive, reliable way to increase your new patients is to get referrals from your current patients. It starts by just asking! Many of your patients would happily refer friends and family members to your practice if the suggestion were made.The basis of a patient referral program is the organization of a conscious effort asking and encouraging patients to refer others. The FCA is offering the "CA Tip of the Week" to fill the need of continuously improving the practice through CA education. Lori Allen and her staff will be joining us at each of our conventions this year. Don't miss out on having your staff trained by one of the best! What do you do when a patient misses an appointment? Do you simply continue on with your day and hope the patient will call to reschedule when they have time? Or, do you have a system in place to reach out to and reschedule that patient?Implementing a recall program gives you this system and opportunity, and helps to prevent patients from falling out of care.